Omid Nourizadeh also known as Omid 16B, is a DJ whose passion for cutting edge electronic music is unrivalled. As a DJ and producer, songwriter, musician and label boss, Omid has forged a unique and prolific career as one of the world’s most talented and respected musicians and producers. Growing up in London, with Persian roots, Omid was influenced by the likes of Jimi Hendrix, The Cure, Depeche Mode, RIDE and The Mission. Throughout his teens he became an accomplished musician playing a list of instruments while attending Richmond College and utilising the music rooms at any given chance. Omid played his first gig in his home town Putney at the age of sixteen (Vocals/ Guitar), performing with his own band “The Reunion” which continued to play the pub circuit in London for a further two years. In the Early nineties the ‘Acid House Movement’ was turning heads, as was Omid’s enthusiasm to learn more about production and the independence to express one’s self without compromise. Gradually Omid’s tastes became increasingly more electronic based rather than indie rock. In 1994, he made the pivotal step of setting up his deep-house label Alola Records, followed by his tech-house driven Disclosure imprint in 1995 and later down the road, SexOnWax Recordings in 2002. The huge impact of ‘Water Ride’ saw 16B reaching to a wider audience, which was performed live on television for Channel 4 in the UK and was included on this debut album, with further singles “Black Hole” and “Falling” bringing in remixes from the likes of legends like Andrew Weatherall, Stacey Pullen and Deep Dish (Dubfire & Sharam). It was also around the same period when Omid’s more diverse ORN moniker released ‘Snow’ first on Alola and now to be re-released on SexOnWax. It was quickly snapped up by James Barton head of A&R at BMG Deconstruction whilst it was still selling on Alola. With a new mix of “Snow” added by Omid himself, Deconstruction turned it into a national hit and marked Omid’s first major label breakthrough around 1999. It was tracks like “InBetween Your Choice” which also put focus on this album and created another impact on the scene. With the collection of singles released from “How To Live 100 Years”, Omid also included the underground fave “The Game” (originally on Disclosure 1997) with a new set of remixes, another single being the garage style groover “Doubt” was also taken from the album. In this time Omid remixed Morel’s “True” which resurrected the acid house vibe yet again, getting massive support from the likes of sasha and DeepDish whilst his remixes of Creamer and K’s “wish you were here” and Steve Lawler’s “Rise In” recognised Omid’s own unique style as one of the most busiest and influential producers on the planet. More Remixes on “Hooj” included “Future” by “Halo Varga” and “Mysterious People’s” “Fly away” on Yoshitoshi whilst playing a major role in starting the label Airtight with Hooj boss Red Jerry. To kick start the label, a set of 16B remixes of Francois K’s “Tout Est Bleu” licensed from Wave, then Marshal Jeffersons “Mushrooms” and finally one single and two sublime E.P’s by Omid himself under the alias “Changing Shape”. (which are to be re released on Alola in 2013). From a remix perspective, Omid has put his touch to artists such as Lana Del Rey (to be released on Alola), Morel, Natasha Atlas, The Cure, Gus Gus, UNA, Creamer & K, Danny Howells, François Kevorkian, Steve Lawler through to Pete Moss, Groove Armada (previously called Rumpus), Telex and DeepDish. Whether it was remixing Depeche Mode’s ‘Enjoy the Silence’ or Prince’s ‘Kiss’, Omid’s bootleg-style assaults have also made him one of the first producers in the field of mashups. Omid has also earned a reputation as an industry innovator and has always been at the forefront of experimental release strategies for his material. In collaboration with DJ Magazine, he was instrumental in launching ‘Face Off’ in 2006, one of the first and most successful cover mount CD series and shortly after, a cover mount CD with DJ Mag that featured part of one of his ‘Like 3 Ears & 1 Eye’ LP in 2007. At the time, this experiment shocked the dance community, but by reaching over 35,000 fans across the UK, it also acted as a unique promotional tool for the album, which was subsequently released digitally on Sexonwax with part two in 2008. Adding to Omid’s stellar production resume in 2010 was the acclaimed ‘Sequential EP’ series, starting with the hedonistic ‘To Run To’, the love song ‘Same As You’ and the ‘The Epic’ on his SexOnWax label. Omid’s most recent compilation project, ‘Sounds Like Alola – Vol.1: Mixed By Omid 16B’, showcases what the future holds mixed seamlessly, while providing insight to the label’s history, Volume 2 was mixed beautifully by Demi featuring artist on the label NAV,Charles Webster, Vince Watson, DJ Q, MR C, Trevor Loveys, Anthony Teasdale, Kevin Beber and Kevin Mckay. The future instalments of the ‘Sounds Like Alola’ series will include mixes by Mr C, Amin Edge and Omid 16B due for release in 2013. As a DJ, Omid maintains an international schedule and tours extensively throughout Europe, the U.S. and Asia. He lays down intelligent and enchanting sets that blend together everything from sublime deep house through to dark, yet soulful, emotive techno. He takes pride in developing the party spirit when the time is right. Omid aims to develop a real connection with the audience throughout his sets. It’s this connection that inspires the performance and brings out the best reaction from the dance floor. 2011 and 2012 have been crazy years for Omid. Following the release of another EP on Alola, the “At Night” EP and the double-A-side ‘Rain / Passion of Zorro’, as well as the follow up ‘The Night / Electronics’ on John Digweed’s Bedrock imprint, Omid maintained a furious touring schedule. From Carl Craig’s Planet E stage at Snowbombing, to the MTV festival in Croatia, the SW4 main stage in London, DJmag’s 20th anniversary show at Space Ibiza, Bestival and the Space Closing party, Omid has moved marquee dance floors worldwide. In addition to his solo work as a DJ and producer, Omid has also taken the leading role in developing a successful and creative partnership with Demi and Desyn Masiello, better known as SOS. Over the past few years, Omid has toured the planet with SexOnSubstance, using their unique inimitable DJ shows to promote their critically acclaimed compilations for Stomp/EQ (‘The SOS Collective – Balance 013’) and Ministry Of Sound (‘MOS pres. SOS’). Whilst being the only act to have done a three Hour Radio One Essential mix instead of the usual two hours, SOS held a long-standing residency as a trio at Ministry Of Sound (London) and are widely recognised as one of the most technically gifted and forward-thinking DJ collectives in the world. While SOS continues to perform at select shows, Omid is once again focusing on his solo work, labels and label artists. His deep and sublime ‘Melodica’, released on Alola in the summer of 2012, was instantly added to Omid’s finest moments. ‘Slap’ on Sexonwax, which saw Omid bring on friends like Da Billa, Demi, Paolo Mojo and SLP on remix duties also created much anticipation for what’s to come. 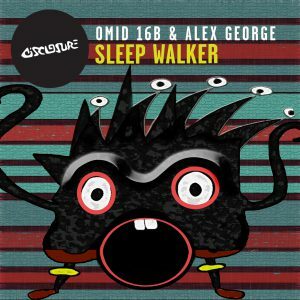 Whilst Omid was busy with a new label management deal to set things up for 2013, he made time for some remixes for new labels like SideWays and GrooveGarden recordings breaking some new acts on the circuit, whilst taking on a few more remixes for the likes of label artists like Chris Gavin, Arnas D, Amine Edge & Dance just to name a few. To celebrate 20 years in the music business, Omid and his Alola label embarked on a series of special events featuring some of the most respected DJs and long standing artists affiliated with aLOLa, alongside some exceptional label releases (Omid 16B – Double You), (John Creamer & Stephane K – I Wish You Were Here) [Remixes] and the Rerelease of Omid’s all time Classic “Escape (Driving To Heaven) to mark this landmark anniversary in style. The aLOLa Events musical odyssey has (so far) included killer line-ups, where Omid 16B was joined on the decks by his hand-picked crème de la crème, the mighty Mr C, the inimitable Danny Howells and Portugal’s legendary DJ Vibe, for exceptional all-night sessions. Each party has seen additional special guests of the highest calibre, such as: Kevin MacKay, Rob Mello, Demi, Rik Parkinson, Silky, Desyn Masiello, Peeping Tom & Darren Emerson, all long-standing friends, playing superb DJ sets throughout and creating a special vibe from start to finish. 2014 saw Omid touring most of the whole year spreading his touch from the UK to the USA through to Asia, supporting his aLOLa 4 compilation (release at the tail end of 2013) including exclusive material by him self and artists from the aLOLa camp. Through out the year Omid made a big step with a new concept for his beloved sister label SexOnWax, a project entitled “reincarnations” introducing a new breed of innovative artists, the idea of true partnership, an egoless collaboration between the two presenting a compilation involving all the elements you’d expect from an artist album, a DJ set and a Producer with vision all in one pack. “I was very selective on who I admired musically and could actually deliver on those 3 major elements naturally, it just had to tick all the right boxes” Omid’s words. Reincarnations 001 was released in the summer of 2014 with Omid 16B presenting Arnas D (from Lithuania) as the opening act on this project, with remixes and new material from both Omid & Arnas including label favourites like Alex George, Dale Middleton & Chris Gavin, joining the dots past, present and future seamlessly. Reincarnations 002 is set for release early part of 2015 with Omid 16B presenting Dale Middleton, another label artist Omid has grown close to in the past few years and kept a close eye on for the future. With a new artist album due in 2018, seven years in the making can only be described as Omid’s patients in certainty to share what he feels is timeless and not just fashionable garbage thats here one day and then forgotten. “ After almost 20 years of writing, music can almost be compared to wine and how wine can improve with age, the longer you can live with it the better it will finally be when its released, its your only true sense in it being timeless or utterly useless”. Also in addition to his new artist album, an ongoing project called “Music For Sleep” will be making an appearance for 2018, an album which original began around 2002 in aid of people having trouble sleeping, melodies and arrangements of sounds that put one into a form of musical hypnosis allowing a more relaxed and peaceful state to emerge. With his undeniable ability and impeccable pedigree, considered alongside his impressive discography and esteemed reputation and charisma, Omid 16B is a formidable talent and a true pioneer on the international dance circuit.